Gareth Huw Davies - Is Swansea's tidal lagoon the new pinup renewable scheme? 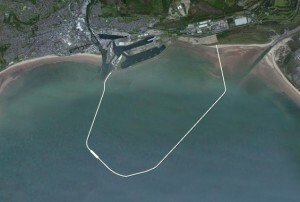 Is Swansea’s tidal lagoon the new pinup renewable scheme? It was the pinup renewable energy project of the early 2000s, a barrage across the mighty Severn estuary. Second highest tides in the world, providing enough clean, green power to provide 5% of the UK’s energy needs. And a new 11 mile (15 km) road and rail link between England and Wales as well. The idea seemed compelling, and irresistible, as the calls to reduce CO2 emissions became ever more insistent. But the UK Parliament’s Energy and Climate Change Select Committee did not agree. In 2013 it said the economic case for the scheme – anything between a less likely £10bn and a more likely £34bn – had not been made. The argument for the impact on jobs and growth, and the protection of the environment, was not strong enough. It recommended proposals for far more modest tidal lagoons be examined first. We and the government now have the chance to do just that. Firm proposals to build as many as five tidal lagoons are before us, and it’s possible the government will grant approval to the first, in Swansea Bay, before the May General Election, always a good time to release positive news. So could tidal lagoons be the new pinup renewable energy project of our times? This is what is immediately attractive about tidal lagoons. According to Mark Shorrock, chief executive of Tidal Lagoon Power, promoters of the the £850m Swansea scheme, 8% of the UK’s domestic electricity could come from the five tidal lagoons he has in mind for UK waters, to be completed by 2023. This would be before any of the proposed new nuclear power stations produced any power. Those five lagoons, and four of them are only at concept stage, or not even that, would cost an estimated £10 billion, producing 60% more power than promised by the Severn barrage, and , together, they would be at the very lowest estimate of the barrage’s cost. The project seems uncomplicated enough: a 9.5km sea wall up to 20m high would close off a tidal sea area of 11.5 sq km. The lagoon would have an annual output of 320 MW, and would be designed to withstand 120 years of heavy water. The sea would move in and out of the lagoon area through the wall which would contain a 250 metre long unit housing 16 turbines of 20 MW each, to generate enough electricity for over 155,000 homes (equivalent to 90% of Swansea Bay’s annual domestic electricity use) . Tidal Lagoon Power announced plans (January 2015) for another tidal lagoon, attached to one side of (and not spanning) the Severn estuary between the Welsh capital Cardiff and Newport. This project would be much bigger than Swansea’s, with a generating capacity of between 1.8 gigawatts and 2.8 gigawatts. One end would be around 2km from the entrance to Cardiff Bay, with the other 2km from the mouth of the River Usk at Newport. A breakwater could extend 8km out into the Severn. Tidal Lagoon Power says it is looking at the “environmental and engineering feasibility” of the scheme and gauging “local community opinion.” A planning application could be submitted by the spring of 2017. The company is also carrying out early consultation work in Colwyn Bay. The “strike rate” is effectively a guaranteed price for the electricity generated, and is paid under the Government’s contract for difference scheme. Agreement on an appropriate strike price and contract period is considered necessary to ensure the project is attractive to investors. The Swansea project already has the backing of The Prudential insurance group, pledging up to £100 million. In 2014 a report by the Centre for Economics and Business Research (Cebr), assessing the economic benefits that could be derived from Tidal Lagoon Power’s (then) proposed construction of six tidal lagoons across the United Kingdom, estimated they could contribute £27 billion to UK GDP over a twelve year construction period, with up to 71,000 jobs at the peak. Once fully operational, they could contribute £3.1 billion in GDP annually over the 120-year design life and produce enough energy to power almost 8 million homes.